People who are trying to lose weight steer clear of dairy because they think it can make them fat. However, studies conducted by Dr. Michael Zemel of the University of Tennessee, and Harvard, Brown and Case Western Reserve Universities showed that an increased daily intake of dairy can actually aid in weight loss. The Calcium Key is a book written by Dr. Zemel and published by John Wiley and Sons. 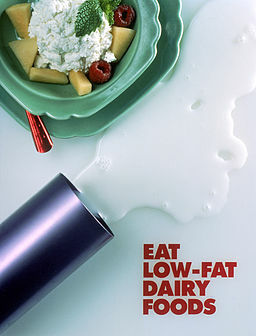 According to the book, a diet which is more on dairy and calcium is beneficial for weight loss. Dr. Zemel proposed that increasing calcium absorption by taking calcitrol (Vitamin D) can have a significant effect on weight loss. However, an interesting point to note is that consumption of dairy products resulted in bigger weight loss compared to consumption of calcium supplements, leading some to believe that there must be something on the dairy other than calcium that influences the weight loss effect. Based on the study conducted by the three universities, Harvard, Brown and Case Western Reserve, participants who consume dairy for a minimum of twice a day have lower body mass index (BMI). Additionally, they have lower chances of developing obesity (only 37 percent). The researchers found that milk, in particular, is the most significant dairy found to help lose weight. Regular intake of milk prevents obesity in women. However, milk must not contain more than 3.4 percent fat. That means whole milk is excluded from the list. Since calcium is included in the study, the researchers ruled out yogurt as it contains insignificant amounts of calcium. Cheese was also not included in the study. Based on the study, researchers concluded that a minimum intake of 214 milligrams of calcium from milk can prevent obesity by 17 percent compared to those who do not eat or drink dairy regularly. Researchers still cannot establish a clear explanation as to how calcium affects weight loss. Several clinical trials still need to be done in order to nail down strong evidence and conclusion. Scientist theorized that calcium may bind with fat cells, thus, preventing them from being absorbed by the body. Another theory is that calcium plays a role in inhibiting hormones involved in fat accumulation. Another theory states that eating at least three servings of calcium-enriched low fat dairy catalyzes fat cells. Whichever is the reason, it can be derived from the various studies that the calcium found in low fat milk is the most effective in producing weight loss and that the amount and type of dairy consumed also play a role. The next time you feel hungry and would like a tummy-filling and delicious snack, prepare yourself a glass of low fat milk. The protein in milk leaves you feeling full and at the same time, can help you lose a few pounds as well.